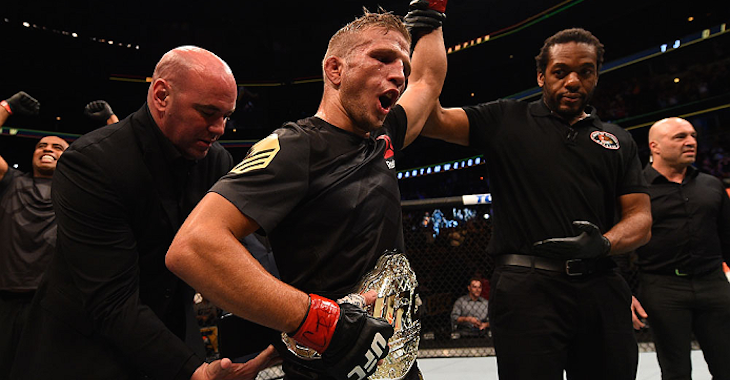 A new report is stating that UFC bantamweight champion TJ Dillashaw will be joining a brand new team in Denver, Colorado, called MP Elevation, and will still continue his training with Duane Ludwig. The report, from Globo, states that sources close to the situation say the champ will be joining the new team, which is being put together by Muscle Pharm and will be held at their Muscle Pharm Sports Science Center Research Institute in Denver. The team is reportedly still in the growing stages and currently houses fighters like Brandon Thatch and Cat Zingano. The report also states that Dillashaw will still work with his striking coach, Duane Ludwig, who also resides in Denver. The timing is what makes this move an interesting one. It’s coming off the heels of a feud between Team Alpha Male’s Urijah Faber and Ludwig, which played out in the media, with both sides giving their stories during interviews. The report did not give any statement from Dillashaw or anyone else involved, but TJ Dillashaw gave a statement to MMAFighting.